Soaking various cuts of meat in a marinade is a good method for adding flavor as well as helping to tenderize the meat. A proper marinade should contain an acidic ingredient such as vinegar or wine, oil such as olive oil, and seasonings such as herbs and spices. Citrus fruit juices may be used in place of the vinegar or wine to provide the acidic ingredient that is necessary to soften the tissues of the meat. The marinade should totally cover the meat in order for it to work effectively. When using tender cuts of beef, a soaking time of 2 hours or less is all that is required because the marinade is used basically to flavor the meat. Tougher cuts of beef should be soaked in the marinade for at least several hours or overnight in order to tenderize the meat as well as flavor it. Always marinate meat in the refrigerator. Since the marinade contains an acidic ingredient, reactive containers such as metal bowls should not be used. It is best to use containers such as glass or plastic bowls or plastic bags that can be sealed. Marinades containing tomato or sugar should be used towards the end of grilling or broiling, since they tend to burn food. Marinades containing oil or butter tend to cause flare-ups when meat is grilled. When meat has been marinated for a long period of time it will shorten the cooking time. Twelve hours of marinating will reduce the cooking time by 30 to 35%. Reuse: The marinade should not be reused for any other purpose because of the bacteria that may be present from having been in contact with the raw meat. The only way the marinade can be reused is to boil it thoroughly for use as a basting liquid or as part of a sauce for the meat. Combine: ½ cup red wine vinegar, 3 tbsp cooking oil, 1 tbsp mustard (preferably Dijon style), 3 garlic cloves (minced), 1 tsp Italian seasoning, ½ tsp course black pepper. Combine: ¼ cup cooking oil, ¾ cup dry white wine, 1 clove (minced) garlic, 1 finely chopped onion, ¼ tsp celery salt, salt and course black pepper to taste. Combine: 1 fresh jalapeño pepper (seeded & minced), 3 cloves (minced garlic), 1 tbsp. ginger, ¼ cup lemon juice, ½ cup dry white wine, ½ tsp sugar, ¼ cup cooking oil. Combine: ¾ cup cooking oil, 2 cups beer, 2 garlic cloves (minced), 3 tbsp lemon juice, 1 tbsp salt, 2 tbsp sugar. 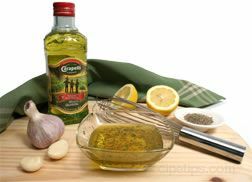 Combine: 1 ½ cups dry white wine, ¼ cup cooking oil, 2 tsp garlic powder, 6 oz. soy sauce, 1 small chopped onion. Combine: 4 tbsp lemon juice, ¾ cup cooking oil, 3 cloves garlic (minced), minced fresh onion (if desired). An additional option for tenderizing beef, as well as adding flavor, is with the use of a rub. A dry mix of herbs and spices are applied to the raw beef and are allowed to permeate and flavor the meat over a period of time, usually overnight in the refrigerator. An endless variety of rubs can be prepared for beef depending on the types of flavors that you want to add to the meat. Application: A rub mixture can be rubbed onto the meat, but the moisture from the meat can cause the dry ingredients to stick to your hands. The best results often occur when the ingredients are sprinkled evenly on all sides. Ingredients: Some of the ingredients that may be used for a dry rub include black pepper, cumin, chili powder, crushed red pepper, celery seed, garlic powder or fresh crushed or minced garlic, salt, and brown sugar. Paste Rub: A small amount of liquid may be added to the mixture in order to create a dry paste, which may be preferred in some cases. Some of the liquids that are often used are vinegar, cider vinegar, wine, or fruit juice. Sugar Usage: Use sugar sparingly because it will melt and burn during the cooking process, especially if the beef is grilled or broiled. Too much of the burnt sugar will provide unpleasant results. Only a small amount of sugar is necessary to provide adequate flavor.